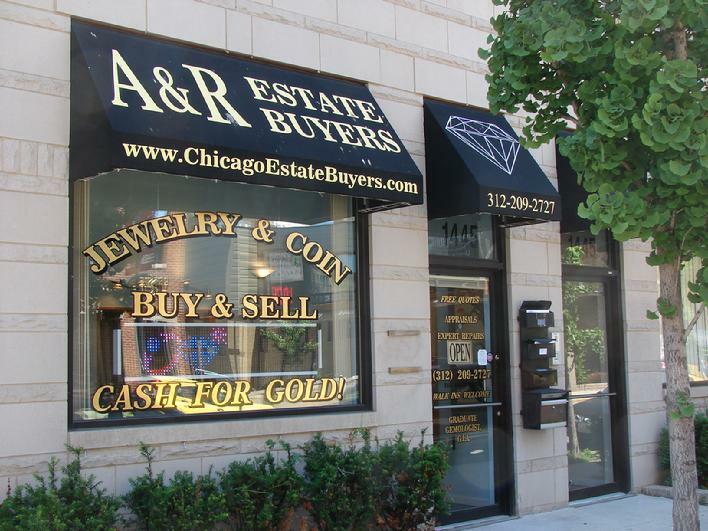 Welcome to ChicagoEstateBuyers.com - the OFFICIAL website of A&R Estate Buyers! NEWS: Gold is STILL HIGH! See us for TOP CASH for your OLD GOLD, DIAMONDS, FINE JEWELRY, HIGH END WATCHES, SILVERWARE AND COLLECTIBLE COINS. We are an exclusive, family owned boutique estate buyer who believes in confidential, one-on-one consultations. Our Graduate Gemologist, G.I.A. will be happy to arrange an appointment. Please be patient- our staff is small but we really care about our clients! *We currently have limited hours due to a family health issue. 2. we usually close the office early after our last appointment. WHO: ChicagoEstateBuyers.com is the official website of A&R Estate Buyers. We are owned and operated by an expert Graduate Gemologist G.I.A. who has been in the estate buying business since 1981. We are committed to INTEGRITY, HONESTY and SERVING OUR CUSTOMERS in every way. WHAT: We buy Diamonds, Scrap Gold, Fine Jewelry and Watches, Collectible Coins, Silverware and other Rarities. We have many private collectors who commission us to pay higher prices than other jewelry stores and pawn shops for fine pieces. We offer FREE EVALUATIONS of your treasures. NO DEAL IS TOO SMALL for us to evaluate. Currently we are commisioned to spend over $600,000 in the next year to find great jewelry and coins! Let us pay some of this to you! WHERE: Our beautiful new Lakeview/Lincoln Park buying office is at 1445 W. Belmont, Chicago, IL 60657. On Belmont - just East of Ashland (between Southport and Greenview). but we are often called out to banks and attorneys' offices to appraise estates, so CALL AHEAD if possible. HOW: You can phone us anytime at 312-209-2727. If we do not pick up, please LEAVE A MESSAGE! - we do try to return all calls as soon as possible. Feel free to contact us for an evaluation of your treasures! Email us at ARestatebuyers@aol.com with any questions and we will be happy to respond! *Regretfully we can not provide any quotes via email or phone. Did you know that licensed second hand buyers in Chicago must go through a rigorous background check by the Chicago Police Department? It is not legal to sell any used item to a regular jewelry store that does not carry a specific SECOND-HAND LICENSE in addition to the General Business License required by all. ASK for your own protection.